Sailing a sabani is a unique experience even for an esperienced yachtsman. Sabani is a traditional Okinawan narrow wooden boat that local fishermen used as their tool of trade in the past. As engines made it possible for fishermen to have larger boats, and wood was replaced with other materials, traditional sabani almost disappeared, and there are almost no one left who knows how to build one. There are no blueprints of sabani construction, so all the knowledge is in the builder’s head. A wooden sabani is built entirely without use of metal nails. The planks in the full are instead kept together with hardwood butterfly-shaped fastenings. In recent years interest in sabani has seen a rebirth of sorts, as people have taken to racing with sailing sabanis, and several races are held every year at various parts of the island. 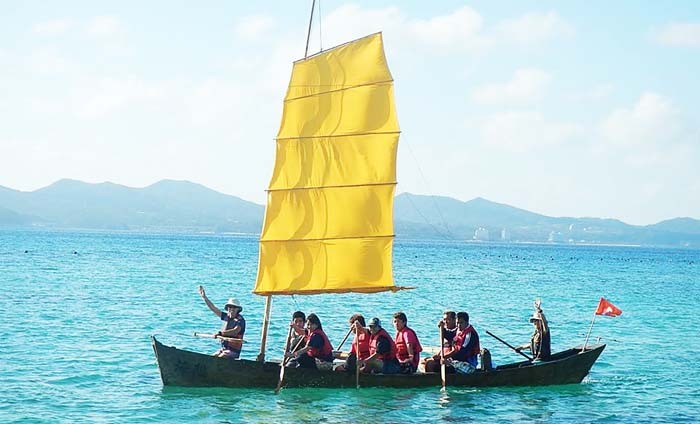 A race for ‘fukaki sabani’ or sailing sabani from Zakimi Island in the Keramas to Naha was organized in 2000 during the Group of Seven Summit of world leaders in Nago. The race was a success and increased people’s awareness of sabani, and there has been regular races ever since. The May 3rd “Fukaki Sabani Asobi” event scheduled to take place at the 21st Century Park Beach has been cancelled die to expected inclement weather. Instead, the sabani sailing race is scheduled to take place from 13:00 to 16:00, on May 4th at Motobu Port as a part of Motobu Katsuonobori Festival. Public has a chance to experience sailing a sabani suring the event. To catch a ride on a sabani, costs ¥500. Organizers say that those who have never ridden in a boat before don’t need to worry because a sabani sailing expert is riding along in every boat. The event has courses for beginners, challengers and experienced sailors. Elementary school students and younger children are required to ride with their parent.